Visit Knotts Berry Farm Amusement Park and enjoy the dozens of rides, shows and attractions. 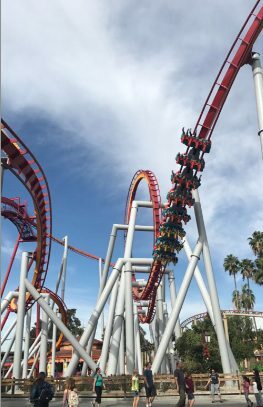 If you love roller coasters, you will want to try the Xcelerator, which launches riders 82 miles per hour in less than three seconds, or the GhostRider wooden coaster. Splash down the Timber Mountain Log Ride, explore the Old West Ghost Town, and meet the gang at Camp Snoopy. There is something for everyone at this theme park. Knott's Berry Farms is centrally located in the greater LA area, just 6 miles north of Disneyland. If you are looking for a day of thrilling roller coaster rides, this park should be on your must visit list. Kids will enjoy the day with Snoopy and the Peanuts Gang without breaking the bank, and you can eat some pie that will remind you of the more nostalgic beginnings of this theme park. Knotts Berry Farm Amusement Park is a premier theme park in Buena Park California, a city just south of the Los Angeles area in Orange County. Theme Park Hours: Open most days. Hours vary, but typically open at 10 AM. Closing time varies, but open later during the summer, special events and weekends. Knotts Soak City Water Park: During the summer, visit their water park for even more fun. The park is open seasonally. Ticket Prices: $79 adults and youth ages 10 and up, children ages 3-11 and seniors age 62 and up $49.00. There are many special discounts and combination passes with other Southern California attractions. See our Knotts Berry Farm Discount Tickets page for more information. Food: Eat at the park and enjoy some pie! Unopened water bottles, baby food and food for guests with special diets are allowed, but otherwise no outside food can be brought into the park. Xcelerator the Ride - If speed is your thrill then the Xcelerator ride is designed for you. Go from 0 to 82 mph in 2.3 seconds on this thrilling rollercoaster ride. Ghost Rider - GhostRider is the largest roller coaster at the amusement park, and the largest and tallest wooden rollercoaster on the west coast. Silver Bullet - The Silver Bullet is an inverted coaster that will send you spinning upside down six times in one ride. HangTime - A new steel roller coaster will open in summer 2018, a dive roller coaster. How fun is that! Other Knotts Berry Farm Attractions: The amusement park offers a variety of other thrill rides and family rides. Enjoy some of the classics like Bigfoot Rapids, Timber Mountain Log Ride and the Calico Railroad. Pan for gold and meet Charlie Brown, Snoopy and the Peanuts Gang. There is something for everyone. The theme park is located at the corner of La Palma and Beach in Buena Park, CA, about 6 miles from Disneyland. 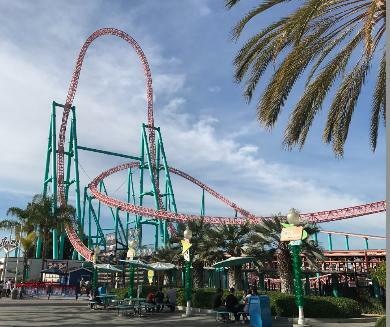 Directions to Knotts Berry Farm from the south: From Interstate 5 in Orange County just north of Anaheim, take exit 11C to merge onto CA-91 west for 1.4 mile. Take exit 23B for Beach Blvd/CA-39 toward Beach Blvd. Follow signs to La Palma Ave. Directions from the north: From Interstate 5 in Los Angeles, follow the signs for CA-60 E/Pomona/Interstate 5 S/Soto St/Santa Ana. Take exit 116 for Beach Blvd/CA-39 toward Beach Blvd. Follow signs to La Palma Ave.
Click on the link above to open the Google Map for Knotts Berry Farm and other attractions in San Diego and southern California.